The Roof of Yosemite Loop travels to the highest point in Yosemite National Park on 13,114 ft Mount Lyell and also includes ascents of 12,900 ft Mount Maclure (5th highest in the park) and 12,561 ft Mount Florence (9th highest in the park). Moreover, Lyell, Maclure and Florence are the three highest named summits in the incredibly scenic Cathedral Range, a spur of the Sierra crest that runs from Tuolumne Meadows to Mount Lyell. The region around Mount Lyell is definitely the most alpine in Yosemite and arguably the most rugged as well. The western side of Lyell and Maclure are particularly rugged and remote with no trail access into Hutchings Creek basin or the Lyell Fork of the Merced River. Nestled between Lyell and Maclure is one of the largest remaining permanent snowfields in the Sierra Nevada. Sadly, this formerly proud glacier was declared no longer active last year. A glacier requires movement of the underlying ice over a slope, but Lyell Glacier’s rapid retreat and mass melting over the last several decades has taken a toll and the ice has now stopped moving altogether. A snow capped Lyell is an iconic view from the southern end of Lyell Canyon, and while snow remains on Lyell year-around to this day, it is sobering to think that Mount Lyell could be devoid of all permanent snow in as little as 25 years according to scientists. The effects of global warming, and especially the rapid warming of California, are plainly visible in the high Sierra. The Roof of Yosemite Loop combines many of the highlights of this region into an aesthetic and highly scenic loop. The route starts with a pleasant trip up one of the easiest stretches of trail in the Sierra in lovely Lyell Canyon next to meadows and the meandering Lyell Fork of the Tuolumne River. After an ascent out of Lyell Canyon, a picturesque alpine lake is reached below Donohue Pass. 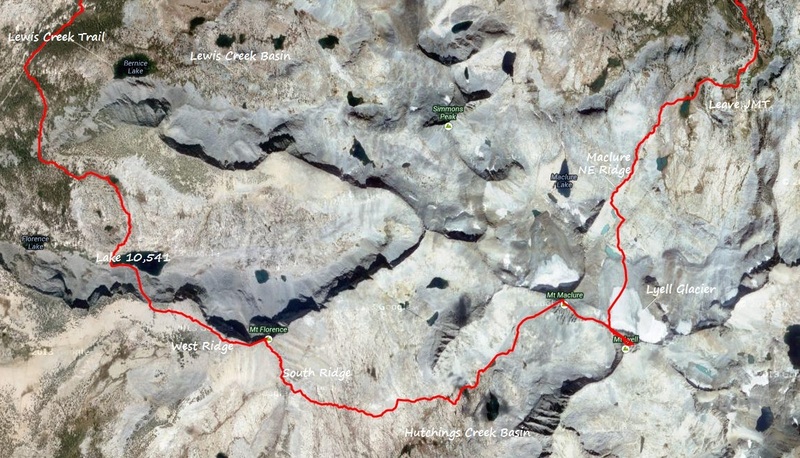 From here, there are a couple ways to reach the Lyell Glacier, but I’ve found the most scenic is to leave the John Muir Trail before it switchbacks to begin the final push to Donohue Pass and ascend west up meadows to an alpine lake with a stellar view of Mount Lyell. From the lake, some talus and low angle granite slabs lead up the northeast ridge of Mount Maclure to some glacial lakes and the snowfield of Lyell “Glacier”. Cross the glacier heading for the northwest ridge and ascend the class 3/4 ridge; the hardest moves are near the bottom and then the angle lessens for the final couple hundred feet of vertical to the summit. Retrace steps to the pass between Lyell and Maclure and ascend Mount Maclure’s SW slope which is mostly class 2. Both Maclure and Lyell provide amazing views of the surrounding region, including the Ritter Range, Cathedral Range, Clark Range, Sierra Crest and Yosemite Valley. From Mount Maclure descend the class 3 southwest chute to the upper reaches of Hutchings Creek basin. The basin is divided into two lobes by Peak 12,358, but the southern lobe is far more scenic with the great cliffs of Mount Lyell’s western face, Mount Maclure and the granitic north side of Peak 12,767 towering above. These peaks provide an awesome backdrop from the many alpine tarns and lakes in the remote basin. From Hutchings Creek Basin, traverse to the south ridge of Mount Florence, gaining the ridge most easily at the broad saddle between point 11,647 and Mount Florence. The ascent of Mount Florence is straightforward class 2 on large talus blocks which can be a bit cumbersome at times. Mount Florence has one of the best views in Yosemite with an amazing panorama including most of Yosemite National Park. From Mount Florence descend talus and sand down the west ridge and then more cumbersome talus down to Lake 10,541 ft, a classic Sierra gem. The north face of Mount Florence towers above this beautiful lake with striking blue waters. From Lake 10,541 head north and northwest traversing easy off-trail terrain before descending into the Lewis Creek drainage to meet up with the Lewis Creek Trail at ~9,600 ft. Take the trail to Vogelsang Pass, Vogelsang Lake and the Vogelsang High Sierra Camp. 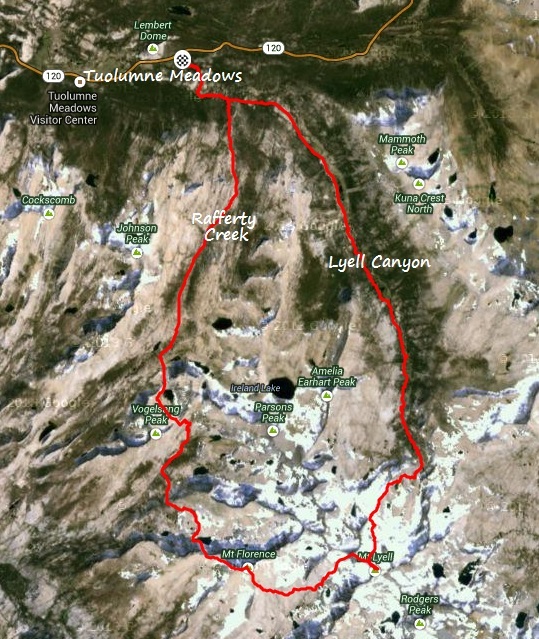 Complete the loop by going to Tuolumne Pass and taking the Rafferty Creek Trail back to Lyell Canyon. Looks fantastic; still hoping you’ll make it back and do something in the Cascades this year! Gotta thank you for all the beautiful pics & inspiration!